Announcing WIGI's new GDC event! 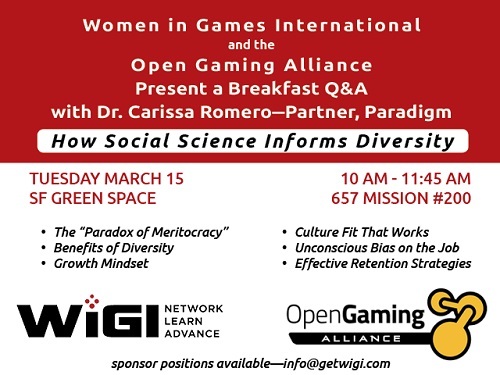 Join Women in Games International and the Open Gaming Alliance for a breakfast Q&A with Dr. Carissa Romero, partner at groundbreaking social science company, Paradigm. We'll be discussing how data science informs increasing diversity in hiring; mentoring employees; developing leadership; reviews, rewards and retention; and the future of a reshaped game industry. Please forward this invite to any of your colleagues who may be interested! Start your GDC off right! Immerse yourself in the coolest demos, networking and mixer at the OGA Networking Lounge. 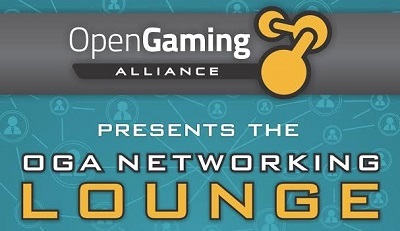 Come meet, connect and network with the Open Gaming Alliance! Dates: Monday March 14, 8 a.m.-6 p.m. and Tuesday March 15, 8 a.m.-7:30 p.m. The OGA Networking Lounge is a space where you can come, connect and schedule some meetings. Meet with Indies, see some cool demos and sit in on some of the OGA's interactive panel discussions. Please check the schedule for more details. Through OGA's Incubator Partner Program the Networking Lounge will be hosting several regional incubators each bringing developers from Montreal, Seattle, Boston and San Francisco. Please join us, GDC passes not required for entry. Register for the OGA Networking Lounge. Use Code WIGI2016 for an Exclusive 20% Members Discount!